When you add an object storage repository that already contains offloaded data, you will be prompted to synchronize this data with your extents. An object storage repository can only be added after existing data (if any) is synchronized. 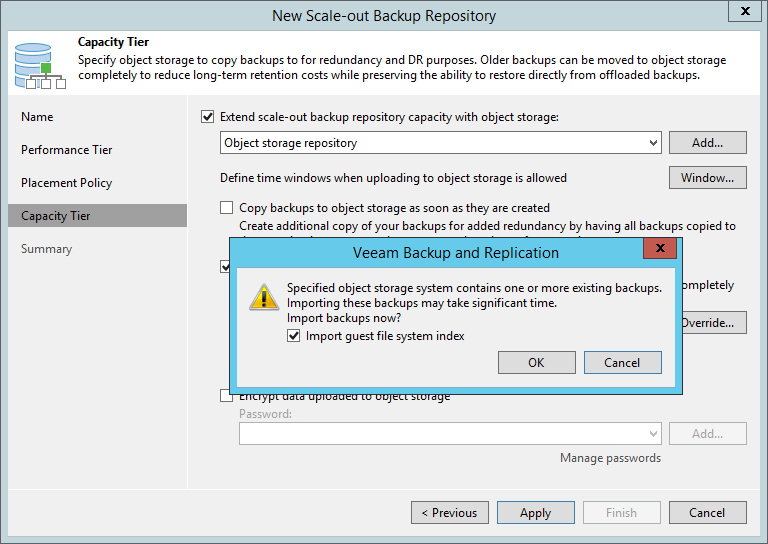 During synchronization, Veeam downloads backup files with metadata located in the object storage repository to the extents that are part of a scale-out backup repository that is being added. These files are created, as described in SOBR Offload Job. Extents to which the data is going to be downloaded (synchronized), will be selected automatically, depending on the available resources. The actual data blocks will not be downloaded and will continue to remain in the object storage repository. When synchronizing encrypted storage, make sure to provide the same exact password with which the data in such storage was encrypted. After the synchronization is complete, all the associated backups located in object storage will become available as imported and will be displayed in the Home view, under the Backups > Imported node in the inventory pane. The following figure shows an example of prompting you to synchronize existing object storage data with your extents.